Click here to see some images of my sculptural/ typographic installation, ‘What Matter / Cén t-údar’ – part of my current exhibition of the same name, showing at Leitrim Sculpture Centre Manorhamilton until 14th July. Mile buíochas/ Many thanks to Jackie Mc Kenna and Seamus Dunbar for their expert help with the stone lettercutting, and to Caoimhín Ó Súilleabháin for translating my poem ‘What Matter’ into Irish and creating a new poem ‘Cén t-údar’ to complement it. The relative look, sound and feel of the two languages give this work an interesting dynamic equilibrium that I have tried to represent visually and aurally. The overall piece comprises the main installation in Mild Steel and found Leitrim limestone, hand-carved in Cló Gaelach script, plus the letterpress print of the original poem in English, plus the sound piece, Caoimhín Ó Súilleabháin reading the poem in Irish. Many thanks to Scott Coombs and Orla Parkinson of Barking Angels Letterpress studio for their invaluable help with the printing. 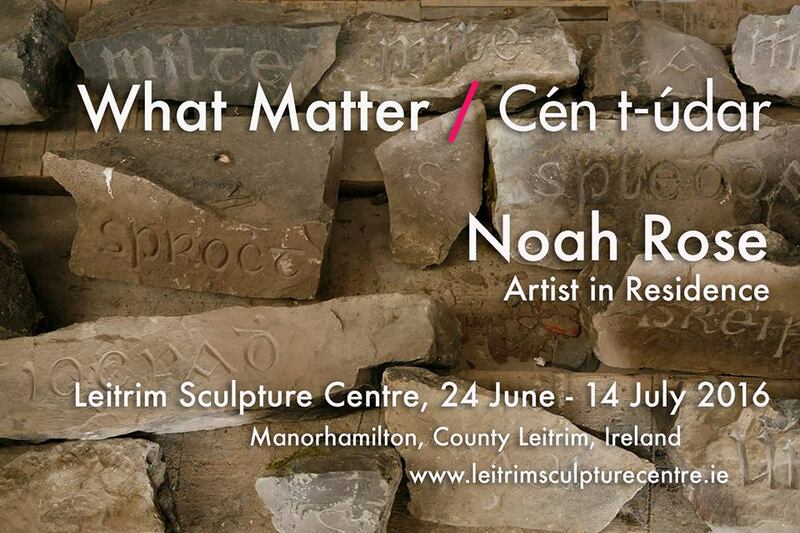 Many thanks to Sean O’Reilly and all at Leitrim Sculpture Centre for all their support during my residency and in helping bring this exhibition to fruition.